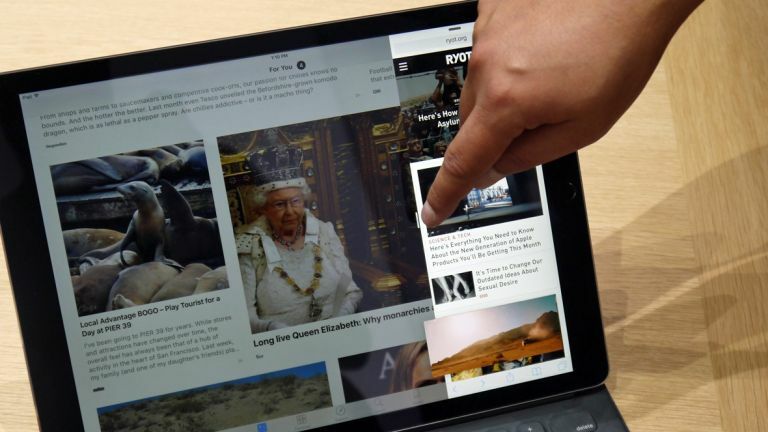 Is the iPad Pro a sad indictment of Apple's post-PC vision, or something else? You want the new iPad Pro, of course you do. Apple has the uncanny knack of making stuff that you just want; it reaches past your eyeballs, grabs your amygdala, and squeezes it till it drips. And yet, beyond sheer mammalian desire and human covetousness, there are plenty of good reasons why you should want the iPad Pro, and so whether you're just interested or whether you're looking to justify the purchase to yourself or your boss – by which we mean your spouse – let us spell out the reasons. The first is that it's the closest an iOS device has come to reproducing the classic laptop experience, in part because of the hardware and in part because of what Apple has done with iOS 9. This might not be a good thing depending on how you like to use your iOS devices – and doubtless some will leap on it as a tacit admission by Apple that its 'post-PC' vision is fundamentally compromised – but the fact that the iPad Pro has a big screen, can run two apps side-by-side (or show video picture-in-picture as you work) and, crucially can have a big hardware keyboard attached to create what to a passing observer is a traditional laptop will be hugely welcomed by lots of people. Even if it's not really much different to what you could achieve with an iPad Air 2 paired with any one of the dozens of third-party Bluetooth keyboards on the market, it does feel different, and that's not to be discounted. The similarities to traditional computers don't end there, either. Apple calls the new A9X chip inside the iPad Pro a 'desktop-class' chip, and while you'd be right to be sceptical of the usual Apple hyperbole, this time it's probably justified; we'll need to test to make sure, but it's likely that this chip, combined with the rumoured 4GB RAM, will make for a properly fast, capable device. Indeed, this is interesting stuff for the future; Apple makes its own chips for its iOS devices, and they're closing the performance gap fast between what we think of as mobile devices and traditional PCs; it's entirely possible that there's a team in Apple porting OS X to these chips just as they did with the PowerPC to Intel switch, and we might see A-series chips in Apple's traditional laptops before long. Of course, Apple's ambitions may instead be to further mature iOS into the successor to OS X, so by buying an iPad Pro you might be using a device that lets you glimpse the future of computing, as Apple sees it. It's terrific to see Apple make a proper keyboard cover for one of its iPads; others, notably Logitech (who also has one imminent for the iPad Pro), have done them before, but this is Apple doing it, and that means not just high quality, but deep integration. Rather than connect over Bluetooth, there's a new port on the iPad Pro, which not only passes data from the keyboard, but also passes power to it; no more forgetting to charge your keyboard. Initial tests suggest the keyboard is good, even if we mean 'good-given-how-thin-it-is'; it uses the same steel domes as in the new MacBook, but rather than use the butterfly switches that Apple developed for that, the stretch of the fabric itself provides the tension for the keys. Clever. And of course there's the new stylus, the Apple Pencil. Scoff all you like at the name, and throw Jobs's line from the iPhone launch about styluses being rubbish back in Apple's face as often as you like, but this thing looks ace. It's pressure- and tilt-sensitive, which are not unique traits among styluses, to be sure, but early testing suggests its very low latency – the pause between drawing a line with the stylus and it appearing on screen – makes it a hugely fluid and natural thing to use. It still needs power, sadly, but you can just juice it up by plugging it into the iPad Pro's Lightning port; charging to 15 seconds gets you half an hour of sketching, and fully charged it'll last for 12 hours. Put the keyboard and the stylus together – though that'll cost ya; both are optional extras – and you get a machine that should be just spectacularly useful and lovely, not just for watching movies and browsing the web, but writing and drawing and annotating and a thousand other things developers will dream up. Apple was at pains to remind us that the Pencil isn't just for creative types, either; as well as a demo from Adobe, Microsoft came on stage at the launch to show how it can be used in Office, and it really did look promising. One other thing: the speakers are really beefed up. Not just louder, but smarter; there are now speakers in each corner, and the iPad Pro uses its sensors to adjust which it uses (think: orientation) so you always get a good, stereo sound stage. The iPad Pro is well named. It's a powerful device whose capabilities will only be further realised as developers learn how to take advantage not only of it its generous screen and meaty internals, but of the keyboard, Pencil, and galaxy of third-party accessories that are doubtless being forged as you read. It's at least a vision how we'll be using computers tomorrow – and who wouldn't want to be using that today? Which tablet/laptop hybrid wins out?